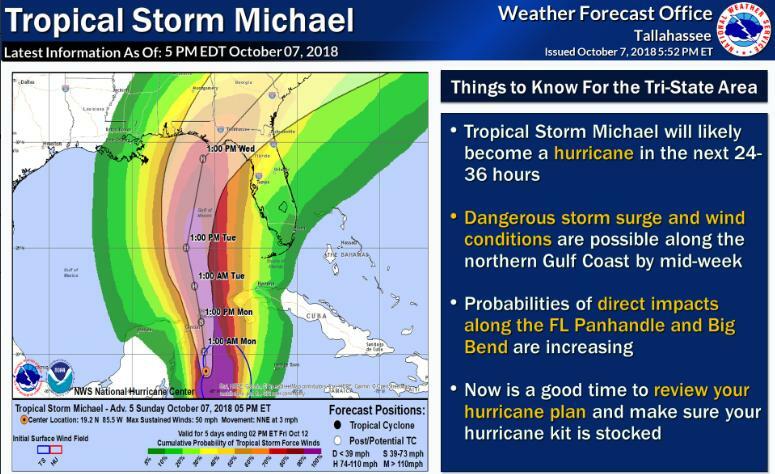 Potential trajectory of Hurricane Michael shows a potential Wednesday landfall as a Category 3 Hurricane. Franklin will be closed Tuesday (10/9) - Friday (10/12). Santa Rosa will have early release Tuesday (10/9) and remain closed Wednesday (10/10). 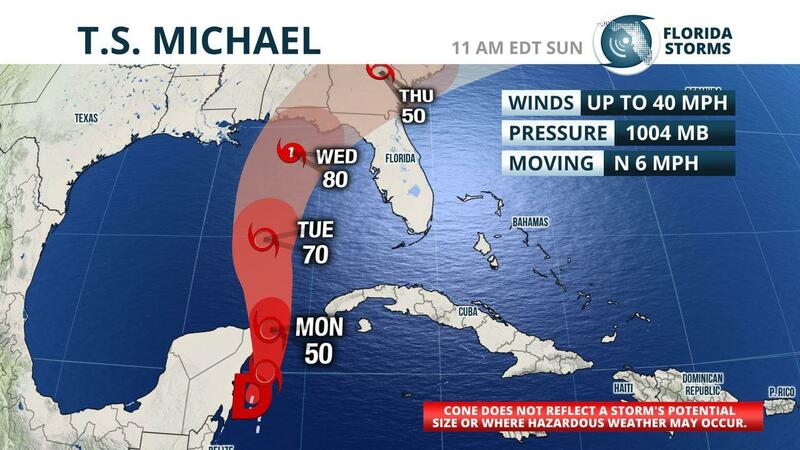 Gulf Coast State College will close at 5 p.m. Monday (10/8) and remain closed Tuesday (10/9) and Wednesday (10/10). Bay County- Mandatory evacuation orders are now in place for zones A, B, and C. Residents living in these areas should evacuate before 6 am tomorrow. Franklin County- A Mandatory Evacuation has been issued for ALL RESIDENTS. Hernando County- Voluntary evacuation order for coastal zone levels A and B for Tuesday beginning at 8 a.m.
Leon County- a Voluntary/Phased evacuation has been issued for mobile homes and low lying flood prone areas. Liberty County- Voluntary evacuations for mobile homes, sub-standard housing and low lying areas. Santa Rosa County- Voluntary evacuations for mobile home parks, campsites and low lying areas. Gadsden County- Mandatory Evacuation for Mobile Homes in Midway, Quincy, Havana, Greensboro, Gretna, Chattahoochee and unincorporated areas of the county.